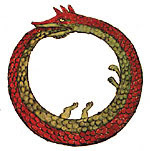 Ouroboros is the snake which forever eats its own tail. It is most often seen as the principle of eternity and indeed of the universe itself. But it also represents a feedback loop, and hence the mind of the subject viewing it. Next Thursday evening, 24 January 2008 at 7.30pm, I will present the première of the sonic performance Ouroboros at the Belltable, 69 O’Connell Street, Limerick. This is part of Excursions 2008 Performance Art Festival. Here's an idea of what to expect. A hum of energy fills an empty room, textured noise creating a ambient wash of sound. This emanates from a number of radios scattered throughout the space. In the centre of the room is a microphone, standing alone. The celebrant enters, bearing an additional radio. As he approaches the microphone the sound becomes more complex; a feedback loop establishes itself between the person and the central apparatus. 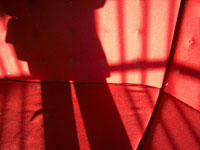 Movements are minute; each fractional change in position of his body subtly alters the texture of the enveloping sound. The audience make up a congregation of sorts, active participants in the sound environment through changes in the positioning of their bodies. They may engage in the sonics as they wish, moving radios or changing their volume. This dance of near-stasis continues into a hypnotic darkness as the room slowly turns black, the sound still (always) present. The cybernetic feedback loop is the simplest model for human consciousness. A mechanism consisting of a microphone, radio transmitter and radio receiver is enough to instantiate this model in a confined space. The celebrant becomes an intimate part of the equilibrium, representing the integration of mind and body, without which consciousness cannot exist. The fact that one of these elements (the radio transmitter) is hidden is a deliberate element of the ritual. It is analogous to the centre of the circle, the part of the mechanism that is assumed from observed effects but never open to direct objective examination. This project has been supported by Daghdha Dance Company. A dream of a snake eating its tail was the inspiration for Kekulé that led him to deduce the ring-like structure of benzene molecules. The Turbulence Network picked up news of the performance here.